The geocentric model was abandoned centuries ago, but philosophers in the antiquity would agree with steeljaw354: They held that there were 7 planets: The Sun, the Moon, Mercury, Venus, Mars, Jupiter and Saturn. They held that there were 7 planets: The Sun, the Moon, Mercury, Venus, Mars, Jupiter and Saturn. The term planet means something like wanderer, and in ancient times all the objects were so called, who are wandering across the sky. So I think only the planets that were known in ancient times, should be called planets: Sun, Moon, Mars, Mercury, Jupiter, Venus! All other would then be 'dwarf planets' because they are so small that they can not seen! Perhaps it is this that gave steeljaw354 the idea. Then it's my fault! Yes, "planet" is Greek, and the Latin term is "stella errans" (as in the old meaning of English "to err" - "to stray off"). In modern languages: "wandering star", "Wandelstern", "vandrestjerne", as opposed to "fixed star", "Fixstern", "fiksstjerne" (Latin "stella fixa"). These terms come from the geocentric worldview. If planet 9 is really real, it should be named Pluto because it is a "destroyer" and "controller" and we should rename Pluto to Cupid because it has a heart on it. Problem solved? And I also think uranus should be renamed to "Caelus" to avoid the issues with the name "uranus". It is pronounced "Say-less" instead of the rather awkward name that uranus has. Rename a planet because an incorrect pronunciation in a single language is the source of jokes? Chances are high that Caelus could be something awkward in some other language. And I also think uranus should be renamed to "Caelus" to avoid the issues with the name "uranus". It is pronounced "Say-less" instead of the rather awkward name that uranus has. The Tartaros is the deepest part of the underworld. And he is the God which rules there. Actually both are the same, the location and the God. Pluto has nothing to say there. JackDole, i like that. need some name that related to something like ghost like, dark and deep. rather awkward name that uranus has. Or what about the name Nibiru? The impact is still the same. There is a distinct bi-modal distribution, with members of each population contained within about 3 orders of magnitude, and the two populations separated by 4 orders of magnitude. So a natural question to ask is why is that? When we see such distributions in nature, there's usually an important physical mechanism behind them. In this case, simulations suggest it is a result of the dynamics of accretion and scattering during planet formation and early solar system evolution. Some might argue that the gap between these two populations could be filled in other systems; that maybe our system is an outlier based on how giant planet migration played out. But simulations suggest the same kind of distribution should appear in general. There will be some differences in terms of the compactness of the system, e.g. around low mass stars, where timescale of removal of objects by collisions becomes important relative to removal by scattering. 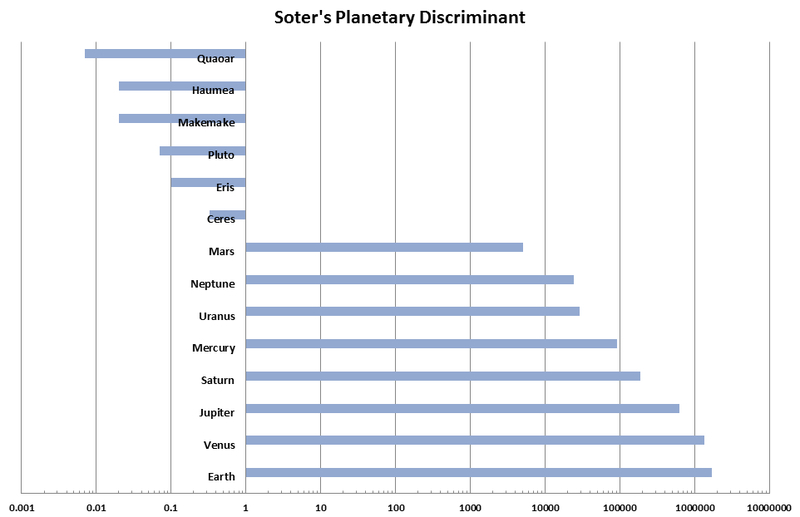 Finally, while Soter's discriminant is a really powerful measure of planethood, it does have a flaw in that it requires knowledge of all the minor material in the orbital space. Of course, we have no such measures outside of our solar system. This is why other metrics were created which attempt to capture "how well" a planet accretes or scatters material from its orbital space, based purely on mass and orbital period which we can determine remotely. Those measures seem to be consistent with Soter's discriminant. Hill Sphere radius is proportional to planet's semi-major axis, and cube root of planet mass. Circumference of planet's orbit scales with semi-major axis. So the probability of a planet-crossing orbit intersecting the Hill Sphere does not depend on that planet's orbital distance, and it grows as the third root of planet mass. That's not a very strong dependence, so you shouldn't expect a huge difference among the giant planets. All well over 100. So we expect scattering. What about the much less massive inner planets? That's still more than 1. Maybe not so much more than 1 to be really convincing. However, if the object was a potential rival to Jupiter, then the inner planets would be passing through its Hill Sphere (a lot more frequently), and they would be scattered. The solar system would not look the way it does. This result is important. The scattering process does not allow objects which are strongly mutually-interacting to exist in such a way that the can stay strongly interacting for very long. Why would there be object with a mass comparable to a solar system planet be in a hugely eccentric orbit with a period of 100,000 years, anyway? Because it got scattered. That's still more than 1. Maybe not so much more than 1 to be really convincing. Well, we can probably safely assume that there aren't 100 such planet like objects in hugely eccentric orbits. It doesn't take much convincing to assume that our solar system indeed has settled. But I think the numbers show that it's reasonable that the process could take several hundred million years and the entire process of forming a proper planet a billion years. Which is a very long time even astronomically. It could also mean that the earliest forms of life on Earth appeared before Earth earned its planethood. The formation of a solar system appears to start rapidly and logarithmically slow down. The star forms relatively fast, the planets need more time to form, and the orbits to settle takes even more time.